At the time of its release, Frampton Comes Alive! was an anomaly, a multi-million-selling (mid-priced) double LP by an artist who had previously never burned up the charts with his long-players in any spectacular way. 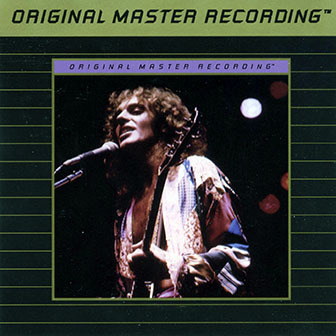 The biggest-selling live album of all time, it made Peter Frampton a household word and generated a monster hit single in "Show Me the Way." And the reason why is easy to hear: the Herd/Humble Pie graduate packed one hell of a punch on-stage — where he was obviously the most comfortable — and, in fact, the live versions of "Show Me the Way," "Do You Feel Like I Do," "Something's Happening," "Shine On," and other album rock staples are much more inspired, confident, and hard-hitting than the studio versions. [The 1999 reissue in A&M's "Remastered Classics" (31454-0930-2) series is a considerable improvement over the original double CD or double LP in terms of sound — the highs are significantly more lustrous, the guitars crunch and soar, and the bottom end really thunders, and so you get a genuine sense of the power of Frampton's live set, at least the heavier parts of his set, rather than the compressed and flat sonic profile of the old double-disc version. Frampton and the band sound significantly closer as well, even on the softer songs such as "Wind of Change," and the disc is impressive listening even a quarter century later. Of course, one must take this all with a grain of salt as a concert document — as was later revealed, there was considerable studio doctoring of the raw live tapes, a phenomenon that set the stage for such unofficial hybrid works as Bruce Springsteen's Live/1975-85 and countless others.] — Bruce Eder.